Sydney Shop Girl: In Search Of Soap. It's going to take a few days to get into holiday mode. I woke up at the crack of dawn today for no particular reason. On the up side, at least I was able to fully appreciate being rugged up in bed on a cold winter's morning safe in the knowledge that I could stay there for as long as I liked. After a while though, the sunlight streaming through the clear sky won. One of many missions today was to find a mysterious soap that has been hovering in my memory yet was proving rather elusive to find. I received the soap as a gift last year from a lady at work. It was completely unexpected which made it greatly appreciated. It sat in the bathroom cabinet for a few months while I waited for our current bar of soap to lather its last, leaving a pleasant but hard to describe scent in the air. I finally got around to using it and by the time I realized how much I loved it, I also realized that I'd thrown away its box and thus had no way of finding it. 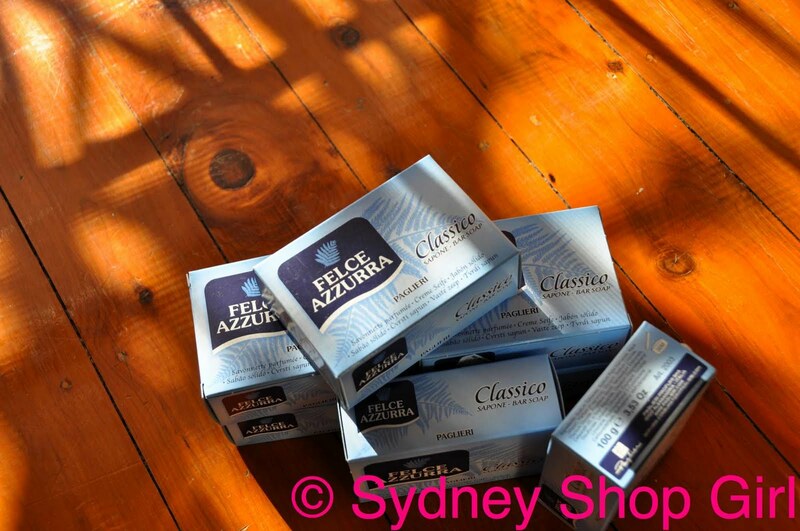 I googled and eBayed "Italian soap in pale blue box" to no avail. It's possibly the one instance in my life where google didn't have the answer readily available. There was that other time too though when I wanted to know when.... Google isn't good at those "when" questions. The mystery remained unsolved until this week when I was reading Good Living while eating my lunch at work. 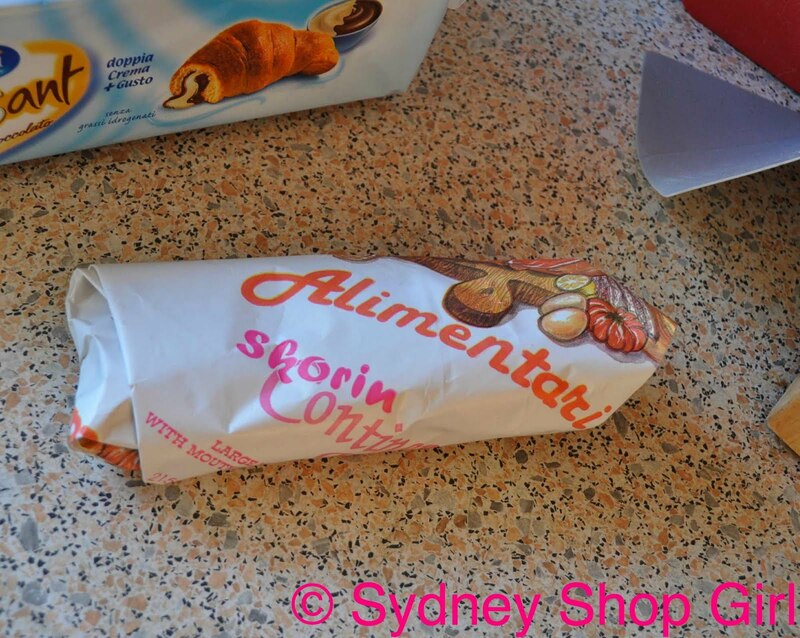 There was a review of Skorin Deli, 215 Concord Rd, North Strathfield. 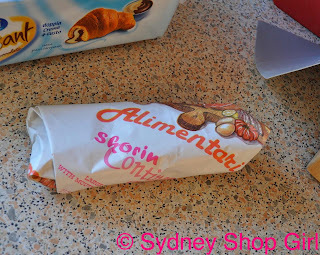 Skorin Deli is a treasure trove of all things Italian. 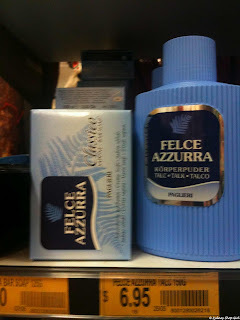 Including, in a casual throw away line of the review, 'Italian toiletries and laundry products'. Skorin is down the road from where I used to work, my mystery soap is Italian - it had to be! It's the unwritten law of crime fiction - the mystery is always solved whilst the investigator is having lunch at their desk. I only wish I had an authentic detective's lunch. Which, in my mind, is a corned beef or pastrami sandwich (neither of which I've ever eaten) with an iced donut for dessert (I'm from the Twin Peaks generation). I have to admit I was apprehensive about finding non food items when I first had a look around. The store was packed to the roof with all sorts of Italian grocery items. 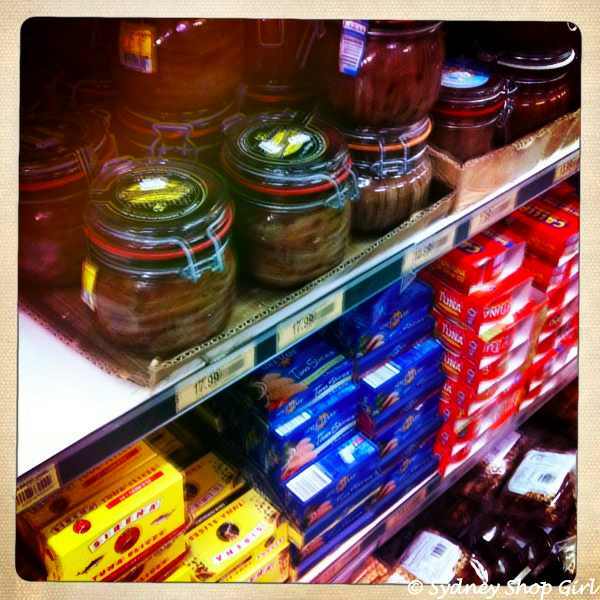 The largest jars of anchovies I've ever seen, canned tomatoes sold by the slab and jars of olives that reached my knees. 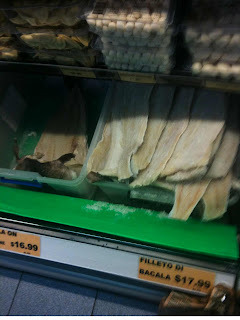 There were cured meats, fresh pastas and salted fish. And there, above the gelatines.... my soap. 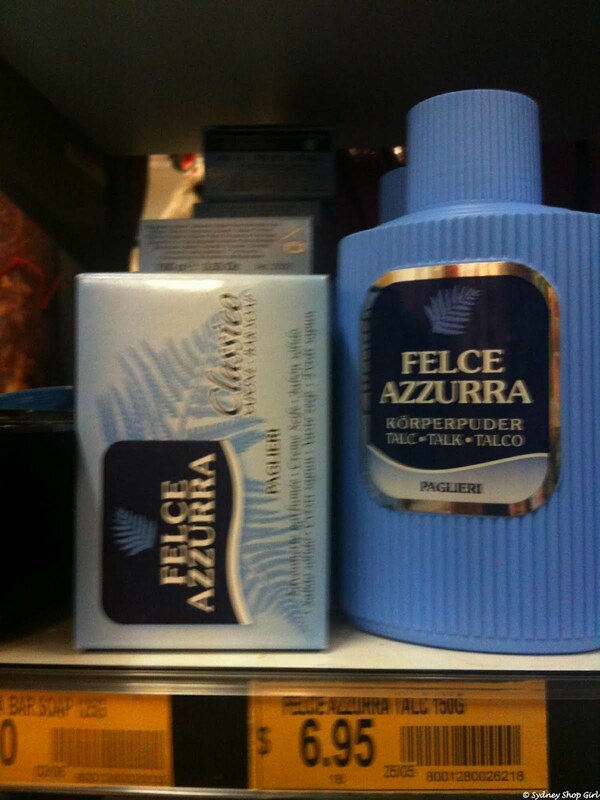 Felce Azzurra - a household brand in Italy. I composed myself and tried not to frighten the elderly Nonnas and their husbands who were out to do their daily shop. I filled my shopping basket with 7 bars and tried to blend in by buying a few token food items too. I can't really describe the scent of this soap. It smells different when lathered as opposed to the strong scent in the box. It's not floral, not 'masculine' or 'soapy' smelling. All I know is that I'm happy to have found it. 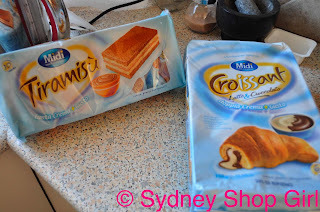 I managed to find both tiramisu and croissant snacks made by the same Italian brand. A love of sweet baked goods is a universal one and cultures are free to borrow from one another. Lastly, a few Italian sausages for Mr SSG. Proper waxed paper with the deli's address printed across it. The rest of the day was just as productive. Errands were completed and the approximate contents of my suitcase and backpack have been assembled. My suitcase is going to be under 23kg come hell or high water. Stay tuned for The Biggest Loser - The Luggage Weigh In. Well you'll be extra clean with all that soap!! Oh my goodness, what on Earth have you packed?! Have just done a suitcase weigh in here as I am flying to Denmark tomorrow. Came in at 22kg. I am super excited as that leaves me 8kg for some gorgeous minimal Scandinavian purchases. I have never pretended to travel light. The Farmer is good at lifting heavy things. Will be spending time, without kids, hanging out with my much younger brother-in-law and his friends. All of whom seem to be female, incredibly stylish, 10 years younger and at least a foot taller than me. Also all have the required Scandinavian long blonde hair and Masters Degrees in obscure languages. Basically seem to be going to the land of the very well educated Barbie doll. Have managed to pull together a wardrobe of Witchery basics with a couple of designer scarves....! Hopefully this will look chic enough. I always get wardrobe anxiety and think everyone will think I am a country bumpkin (Admittedly one with a significant on-line shopping habit). I hope you and Mr SSG have an absolutely fantastic time in Japan. Enjoy. Lanelle Elizabeth: it's what I haven't packed. It has been brutal. A Farmer's Wife: don't let anyone forget that Princess Mary herself came from Australia. Hold your hear high. There is alot to be said for online shopping and I admire your skill with Witchery. It is not a label that I wear well at all. Not for want of trying. You will look well put together. Have a lovely trip too. drx: I am on a roll. Today I will attempt to solve the mystery of packing light ie under the prescribed weight limit for cattle class. 5. and above all: I wish you are beautiful, happy holiday! !